A map of the Oregon Trail, marking Independence. Independence is located at (39.079805, −94.406551). It lies on the south bank of the Missouri River, near the western edge of the state. According to the United States Census Bureau, the city has a total area of 78.25 square miles (202.67 km2), of which, 77.57 square miles (200.91 km2) is land and 0.68 square miles (1.76 km2) is water. As of the census of 2010, there were 116,830 people, 48,742 households, and 30,165 families residing in the city. The population density was 1,506.1 inhabitants per square mile (581.5/km2). There were 53,834 housing units at an average density of 694.0 per square mile (268.0/km2). The racial makeup of the city was 85.7% White, 5.6% African American, 0.6% Native American, 1.0% Asian, 0.7% Pacific Islander alone (1.0% Pacific Islander alone or in combination with one or more other races), 3.2% from other races, and 3.2% from two or more races. Hispanic or Latino of any race were 7.7% of the population. Non-Hispanic Whites were 82.2% of the population, down from 98.4% in 1970. There were 48,742 households of which 29.3% had children under the age of 18 living with them, 42.5% were married couples living together, 13.9% had a female householder with no husband present, 5.4% had a male householder with no wife present, and 38.1% were non-families. 31.7% of all households were made up of individuals and 11.5% had someone living alone who was 65 years of age or older. The average household size was 2.37 and the average family size was 2.97. The median age in the city was 39.4 years. 23% of residents were under the age of 18; 8.6% were between the ages of 18 and 24; 24.9% were from 25 to 44; 27.4% were from 45 to 64; and 16.1% were 65 years of age or older. The gender makeup of the city was 48.0% male and 52.0% female. In the city, the population was spread out with 23.9% under the age of 18, 8.7% from 18 to 24, 28.9% from 25 to 44, 23.0% from 45 to 64, and 15.5% who were 65 years of age or older. The median age was 38 years. For every 100 females there were 91.6 males. For every 100 females age 18 and over, there were 87.3 males. Midwest Genealogy Center, the largest stand-alone public genealogy research library in America. The Center for the Study of the Korean War, the largest Korean War archive in the U.S., at Graceland University. Merrill J. Mattes Research Library, largest public research library in the U.S. focused on the Overland Trails, and the settlement of the American West. Located at the National Frontier Trails Museum. Truman Library Research Center, at the Harry S. Truman Presidential Library and Museum. Jackson County Historical Society Archives & Research Library. Mid-Continent Public Library operates two general library branches in Independence. Kansas City Public Library operates the Trails West Branch in Independence. Santa-Cali-Gon Days is an annual Labor Day festival held in Independence intermittently since 1940 and continuously since 1973, celebrating the city's heritage as a starting point of three major frontier trails: the Santa Fe, California and Oregon. Another popular annual festival is the Vaile Strawberry Festival, which is held on the first Saturday of June at the Vaile Mansion, 1500 N. Liberty, five blocks north of the historic Square. The Independence Heritage Festival is a celebration of the diverse culture that exist in Independence. The Independence town square features numerous family-owned shops surrounding the old main courthouse, which was modeled after Philadelphia's Independence Hall. 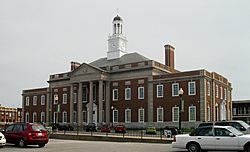 This courthouse houses Harry S. Truman's former courtroom and office. National Frontier Trails Museum, 318 W. Pacific: Museum and interpretive center dedicated to the history of the Overland Trails and the settlement of the American West. 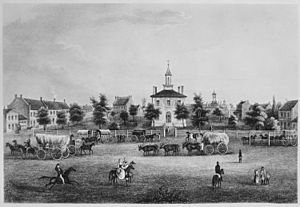 Independence, also known as the Queen City of the Trails, hosted thousands of settlers, pioneers, soldiers and merchants as they prepared to cross the plans along one of three trails: the Santa Fe, California, and Oregon. The museum offers film, a children's activity room, artifacts, journal entries, maps, and covered wagons, among other highlights. Harry S. Truman Presidential Library and Museum: Official library of the 33rd U.S. President located at 500 U. S. 24 Highway. Hailed as America's "best presidential museum" by the Dallas Morning News, the Truman Library offers theaters, a museum, store, and interactive hands-on exhibits together with a Decision Theater. The museum contains a colorful mural by Thomas Hart Benton, together with a reproduction of the Oval Office. The courtyard contains the graves of Harry, Bess and their daughter Margaret. The museum seeks to educate patrons about the major world-shaping decisions that Truman was involved in as President, together with details of his personal life. The lower level offers an area where children can dress up like Harry and Bess, explore "feely" boxes, engage in an interactive computerized race, sort mail, make campaign buttons and posters and play a trivia game. Harry S. Truman National Historic Site, 223 N. Main. The Truman home is operated by the National Park Service. It allows visitors to see how President Truman and his wife, Bess, lived in their simple but comfortable "Summer White House". Left just as it was when the Trumans lived there, you'll see their dishes on the table, books and records on the shelf, and Harry's hat, coat and cane in the front entry. 1859 Jail, Marshal's Home and Museum, 217 N. Main. The dungeon-like cells of the 1859 Jail housed thousands of prisoners during the bloodiest period of Jackson County's history. Some of its famous guests included Frank James and William Clark Quantrill. Part of the exhibit details how the local marshal and his family lived in the adjoining Federal brick two-story home. An 1870s-era schoolhouse and museum completes the site. A "historic homes combo" discount ticket is available for use with the Bingham-Waggoner Estate and the Vaile Mansion. Closed for the winter from January through March. Bingham-Waggoner Estate, 313 W. Pacific. Built in 1852 along the Santa Fe Trail, this magnificent home was owned by famous American Civil War artist George Caleb Bingham and later belonged to the Waggoner family, founders of the Waggoner-Gates Mill. Extensively renovated in the 1890s, many furnishings and accessories from the era may be seen in the home. A gift shop is located in the carriage house. Closed for the winter from January through March. Chicago and Alton Depot, 318 W. Pacific. Built in 1879, this wooden depot is believed to be the oldest two-story frame railroad depot remaining in Missouri. Filled with hundreds of railroad artifacts, it also served as the living quarters for the station master and his family on the upper level, which is furnished with period treasures. Closed January–March. Vaile Mansion, 1500 N. Liberty. This thirty-one-room mansion was built by frontier business tycon Harvey Vaile in 1881. Recognized as one of the finest examples of Second Empire Victorian architecture in the U.S., the opulent estate boasted conveniences such as flushing toilets, a built-in 6,000 gallon water tank, painted woodwork and ceilings and nine different marble fireplaces. Closed for the winter from January through March. Community of Christ International Headquarters. The Temple, at 201 S. River, and The Auditorium, across the street at 1001 W. Walnut, serve as world headquarters for this Christian denomination of a quarter-million members. Tours of the Temple and Auditorium are free, and organ concerts on world class organs are held daily in summer, and on Sundays from Labor day through Memorial Day. The site also offers a theater, sacred artwork and a meditation garden. The Children's Peace Pavilion in the Auditorium is a free hands-on interactive museum for children. LDS Visitors Center, 937 W. Walnut. Describes the roles played by Latter-day Saints during the early and tempestuous history of Independence. Offers flat screen visual presentations showing the arrival of early Saints, revelations, and their pioneer lives. Also offers rare artifacts and exhibits documenting the history and beliefs of modern Saints, known as Mormons. Free guided tours daily. Blue River Community College features a soccer program with a men's team and women's team. The Trailblazers (men) went all the way to the NJCAA Region 16 semifinals before concluding their season. The Lady Trailblazers (women) finished as runners up in the region. The Independence Events Center is home of the Missouri Mavericks, a Central Hockey League mid-level professional hockey team. Independence Events Center also the home of Missouri Comets of the Major Arena Soccer League the top level of professional indoor soccer. Crysler Stadium is the home of the collegiate summer baseball Independence Veterans of the Mid-Plains League. There is a street in Independence south of Truman Rd. between Memorial Dr. and Lynn St. (between City Hall and the Independence Square, west of Noland Rd.) called Higashimurayama. Independence, Missouri Facts for Kids. Kiddle Encyclopedia.